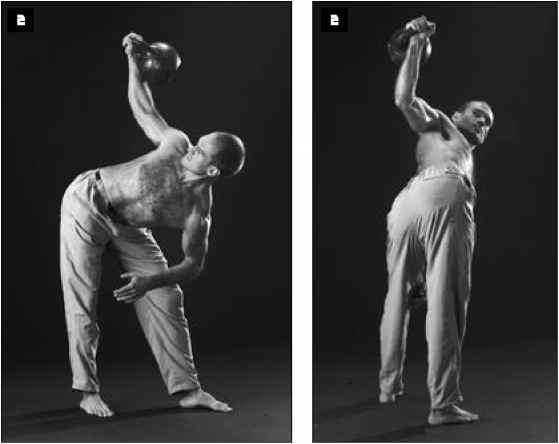 Straighten your body and then lower the bell slowly. Lowering the bell slowly is important for you will obtain almost as much benefit and development from lowering as from raising. At the low point the bell should be just opposite to the shoulder and about eight inches away from it. You should deliberately harden the muscles of the upper back as the bell is lowered, so that the back muscles form a shelf or resting point for the horizontal upper arm. 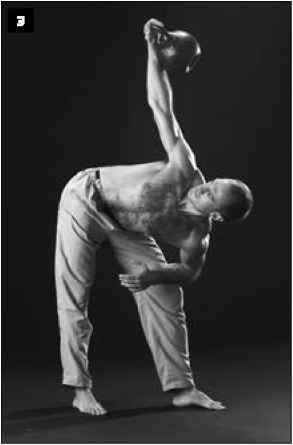 When you learn this movement properly, leaning toward the left foot, placing your weight upon the left foot, will cause the weight to go up almost of its own accord." Do not disregard the unusual recommendation to flare the lat on the way down; this long lost secret enables you to train the lats with a pressing movement. Eventually, you will notice how the lats are doing at least as much work as the delts, as you are side pressing the bell up. It's as if your upper arm is a post, erected by two opposing sets of guy wires. Ask a bodybuilder how to perform a lat spread, if you are having trouble with this technique. Once you have learned to get the latissimus dorsi involved in the act of pressing, your poundages on all pressing exercises will suddenly jump up. That includes the bench press; experienced powerlifters always flex their lats to get the bar moving off the chest. If you have a shoulder problem, but your doctor has okayed this exercise, you may find that the side press is the only type of a pushing movement that does not aggravate your shoulder. Again, thanks to the lat, this time for stabilizing the joint. This lift, popularized by Russian strength and physique legend Eugene Sandow, is one of my favorites. In his 1941 The Big Chest Book Hoffman wrote, "Arthur Saxon is a good example of concentrating on the bent press. Although he weighed but little more than 200 pounds, small as strong men go, he was one of the greatest strong men in history in all around strength. 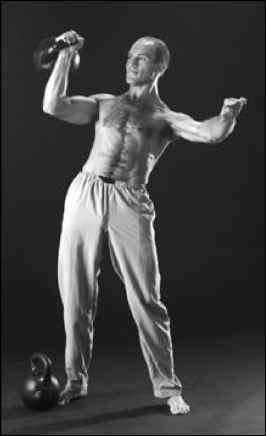 He proved that the bent press, more than any other single lift, will build great bodily strength and all around power in the human body, and skill in other lifts. The history of weight lifting discloses the fact that the best-built men have been bent pressers. Eugene Sandow, more than any other man, popularized this lift and the world has never ceased to sing the praises of this man, considered by many strength lovers to be the best built man that ever lived. Eugene Sandow, more than any other man, "Bent pressing leads to proficiency in all popularized this lift and the world has never .,.1 1 • rl t 1 .l • 1 r ceased to sing the praises of this man, other lifts-•• In bent pressing every muscle of considered by many strength lovers to be the body is used. As I said before, it requires the best built man that ever lived. and develops strength in every part of the body. It teaches most of all balance, timing, coordination, and endurance, for a considerable time elapses from the beginning to the consummation of this lift." The York Barbell and Strength & Health founder gave the bent press just as much praise in his other books, Big Arms, and Big Shoulders, because the bent press does not leave a single muscle group unworked. Ever since the fitness craze in the 1980’s, we have become a nation increasingly aware of our health and physique. Millions of dollars are spent every year in the quest for a perfect body. Gyms are big business, personal trainers are making a tidy living helping people stay fit, and body building supplements are at an all-time level of performance.